Metal Biz Recyclers is a car and metal recycling company located in Rocklea, Australia. They have three scrap yards in Brisbane located specifically in Rocklea, Geebung, and Slacks Creek. From these outlets, they collect scrap metal, unwanted cars, buses, and trucks. Customers can either deliver their scrap metal to these yards or can take advantage of Metal biz’s free collection services. Metal Biz recyclers believe in metal recycling as a way of promoting environmental causes. It is their goal to reduce the excessive reliance on virgin metal ores. This helps in reducing the industrial impacts on the environment usually from greenhouse emission. In addition, by recycling waste Metal Biz Recyclers reduces the need for landfilling hence less leaching of toxic chemicals. Above all, they offer cash for scrap metals for clients in different parts of Australia. Metal Biz Recyclers offers cash for scrap metals in a fast, efficient and professional way. They also offer pickup and collection services with the help of their three scrap yard outlets in Brisbane. The types of metals that they recycle include both ferrous and non-ferrous ones. These include aluminium, copper, brass, steel, iron, and lead among others. The metal recyclers also offer large scale scrap metal collection and industrial/manufacturing waste metal inquiries. Once they’ve collected these scrap, they weigh them and offer cash per weight. Metal Biz Recyclers also offers junk car removal and recycling services for clients across Queensland, Caboolture, Ipswich, and Gold Coast. No extra charges are usually applied for the collection services. In addition, most of the work is done on a same-day basis. Customers with jalopies or recently crashed vehicles can request a quote just to know what to expect. One thing to note, however, is that Metal Biz does not buy working car parts. They buy the whole thing and treat anything less of a car as scrap metal. 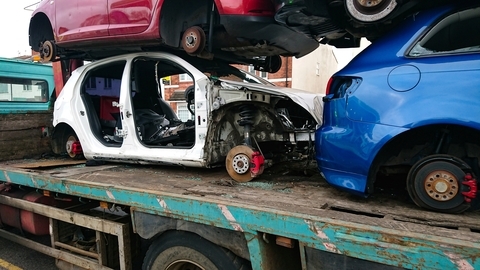 The services under cash for cars are subcategorized into car removal, 4×4, truck and bus wrecking. Metal biz collects cars that have been written off, strips them into parts and pays cash for the scrap metal recovered. They offer free onsite collection as well as competitive scrap metal prices. All the collected material is then weighed in any of their weighbridges in Brisbane. Trucks and tractors have heavy metals on them which metal recyclers will pay top dollar for. Metal Biz purchases the entire truck irrespective of the size or condition. The client just needs to fill in the make and model of the truck in question and they’ll receive an estimate from Metal Biz. This takes care of broken or old SUVs. The company has three 4×4 wrecking yards in Rocklea, Geebung and Slacks Creek. Metal Biz accepts wrecked and non-running buses too. Customers can recoup up to A$8,999 on what might be deemed as unwanted buses. All they need to do is verify the make, model, and age of the bus. Metal Biz delivers eco-friendly metal bins to provide a structured one-off scrap metal and junk car removal services. Each client gets a bin size that fits their scrap metal volume. Once these bins are filled up, Metal Biz sends someone to pick them, weigh them at the nearest scrapyard, and provides the right price. Some of the bins offered include Marell, Hook and Standard bin types. The scrap metals eligible for bins service include offcuts, metal turnings, scrap from manufacturing, written off machines, building scrap, and most ferrous and non-ferrous metals. However, the metal bins services are only accessible to commercial and industrial clients. They do not offer home or domestic collections. Therefore, qualified sites include building sites, fencing companies, window fabricators, engineering sites and manufacturing industries. Those willing to use the services of Metal Biz Recyclers can reach them on their address 42 Ashover Road, Rocklea, QLD 4106 or call them at 0731885857. Their scrapyards are open Monday to Friday from 6:30 a.m. to 4:30 p.m. (and 1:00 p.m. on Saturday).